All Google Analytics data is a combination of two essential parts: metrics and dimensions. Metric is a real quantitative value/number to measure things. A great example would be sessions, unique users, bounce rate, page load time. Dimension yet are used to split or group your data. It's like extra attributes assigned to that specific measurement. For example, any page view can also have assigned information of browser version, country of a user, page load time and many other facts. 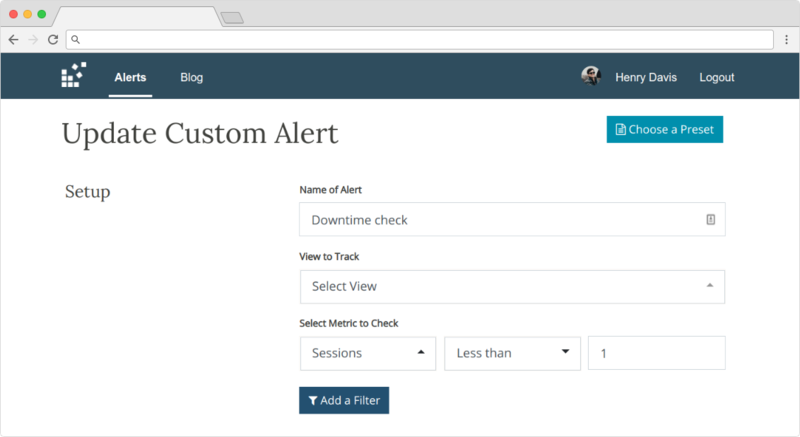 So by setting up a custom alert, you'll need to choose your metric to track and from 0 to 3 extra filters for your dimensions. Having this flexibility, you can ensure that only critical alerts will reach you out. 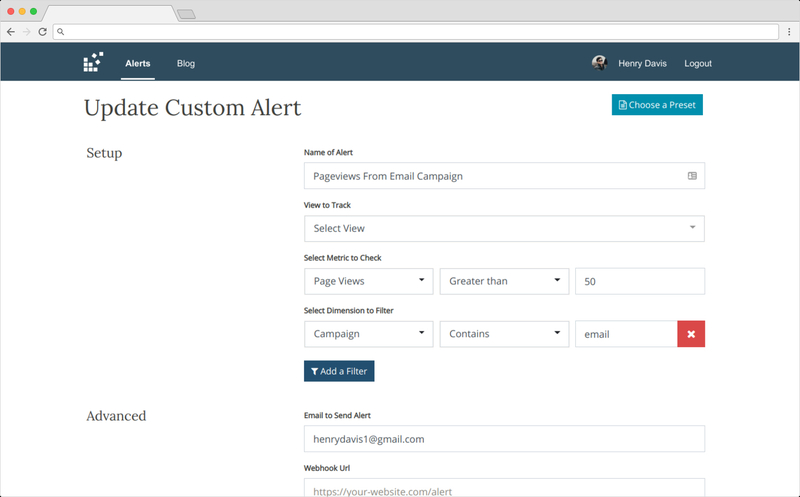 If you're sending any email campaigns, you want to know whenever those campaigns were effective. 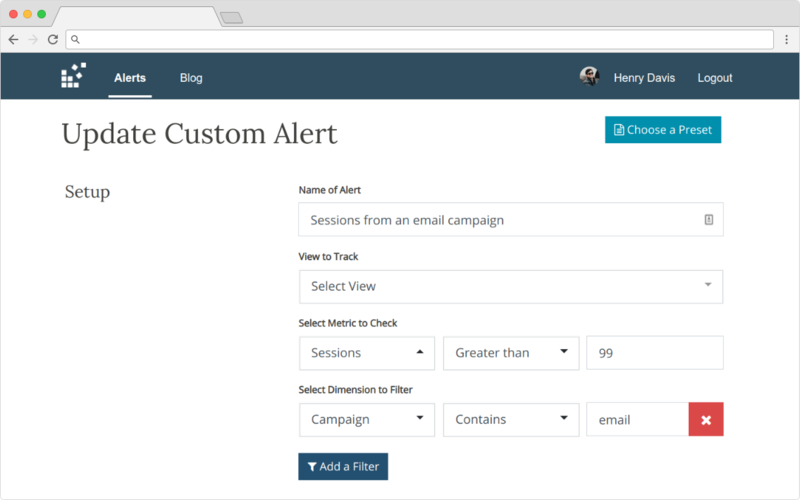 However, if you're not drilling down to the numbers you can add a custom alert which would inform you if it reaches some specific goal like 100 sessions. This way you would know that the campaign was successful. Select "Campaign" as a dimension, "Contains" as an operator and "email" (or specific name of your campaign) as a value. If you're sharing links or somehow expecting some decent traffic from referral then setup a traffic alert of it. This way you'll know whenever referral delivers upon your expectations or inform you when referral remove the link. Select "Referral Path" as a dimension, "Contains" as an operator and "PARTNER WEBSITE" as a value. Similarly to the point above you should have some expectations of your daily KPI results. By setting up the Goal alert, you can be sure that your daily routines won't drive your attention from the decreased conversions. Pro Tip: if you don't have Google Analytics goals setup in place you can use page url as a dimension filter and page views as a metric. Many of us have some low-value websites that aren't visited frequently, but they have some daily visitors, and we care that they would be online. If you don't want to setup a monitoring system for them, another way would be to setup a custom alert which would check whenever it received zero users. Pro tip: you've probably already noticed a problem when a website can be online but received zero visitors, and thus you've got a notification. While it's true that the alert would be a false-positive in this case you should consider if that website is worth your attention at all? What's the point of having a site which doesn't have visitors?